Singapore, July 2017 – For one night only on 12 July 2017, the iconic tube at Orchard Gateway Level 3 was transformed into a unique party mecca to celebrate the official launch of BMF Bella Marie France and their flagship centre, that is located at Level 10, Orchard Gateway @ Emerald. This new beauty name in town is the result of the unification of two long-standing and best-known beauty service brands, Bella Skin Care and Marie France Bodyline, with a combined experience of over 70 years in the industry. The new state-of-the-art centre is positioned as a Beauty Gym with whole lot of goodness that offers a plethora of cutting-edge skin and body treatments that gives clients the freedom to pursue a curated and precise rejuvenation regime rooted in science. Every step is digitised for advanced diagnostic, consultation and treatment processes. It is a place where clients can be rest assured of the quality and professionalism as they realise their best beauty potential and walk out rejuvenated with confidence. There was an air of anticipation and excitement at the tube as more than 100 invited guests, comprising members of the media, make-up artists and influencers, turned up to witness this milestone occasion, with a special appearance by BMF Bella Marie France celebrity ambassador, Fann Wong. The ambience was convivial and indulgent as guests enjoyed the generous servings of specially-prepared canapes and endless flow of champagne as automobiles whizzed past beneath the glass bridge. The GIF and 180 Looper booths added to the fun of the celebration as guests gamely preened and posed for the perfect interactive photo. The launch kickstarted with a welcome by debonair emcee, Bobby Tonelli, before Ms Amy Quek, Chief Executive Officer of Global Beauty International (GBIL), the company behind BMF Bella Marie France, was introduced to share more about the unification of the two brands. 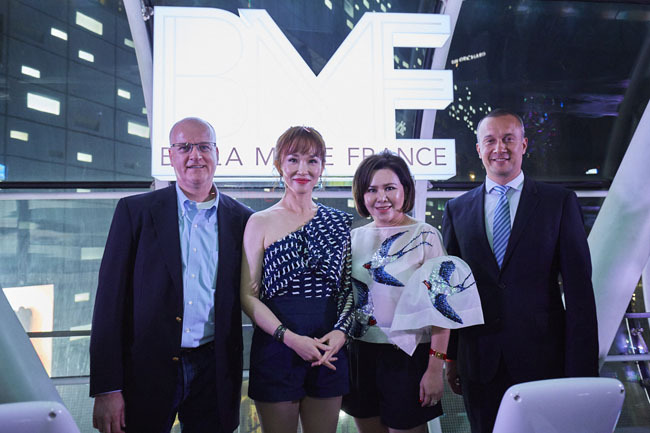 Everyone cheered and clapped as BMF Bella Marie France celebrity ambassador, Fann Wong, made her entrance and shared about her experience at the brand new centre, including her favourite BMF Bella Marie France treatment and her favourite spot at the Beauty Gym. Fann Wong was then joined on stage by Ms Amy Quek; Mr Jason Kardachi, Director; and Mr Patrick Schwarz, Chief Financial Officer of GBIL, as they inaugurate the launch of the new BMF Bella Marie France centre by placing their palms on the iPad stands. A colourful burst of confetti filled the tube as words of congratulations were exchanged. Guests were then ushered up to BMF Bella Marie France for a tour of the Beauty Gym, complete with “live” demonstrations of the various skin and body combination treatments.